The Union-level Joint Monitoring Committee (JMC-U) vice-chair (1) Maj-Gen Saw Isaac Poe said the JMC needs to gain success in practical implementation. Maj-Gen Saw Issac gave the advice in his opening speech at the 18th JMC-U meeting, which kicked off at the National Reconciliation and Peace Center (NRPC) in Yangon yesterday morning (September 12). “Our JMC shouldn’t only be a figurehead and it needs to be effective and successful in practical implementation. Whether or not the JMC’s implementation is successful depends only on us. That’s why everything that’s happening on the ground and whether they are successful or not, this is the truth,” he said. Maj-Gen Saw Isaac Poe continued that one can review the advantages and disadvantages and achieve success by getting rid of the disadvantages and supplementing and implementing the advantages only if he or she can accept the truth. The 18th JMC-U meeting is being held from September 12 to 14. The JMC-U chair Lt-Gen Yar Pyae from the Tatmadaw, vice-chair 1 Maj-Gen Saw Isaac Poe from the Karen National Union (KNU), and vice-chair 2 Sai Myo Thant, a civilian representative, gave their opening remarks on the first day of the meeting. “I want to warn everyone not to do area settlement and gather military power in order to avoid confrontations while trust is being built between each other,” said Lt-Gen Yar Pyae, chair of the JMC. He continued that all sides should strengthen the common identity of the Union rather than prioritizing their own identities in trust-building as it will bring mutual benefits so he urged them to take caution in giving too much priority to self-identity. 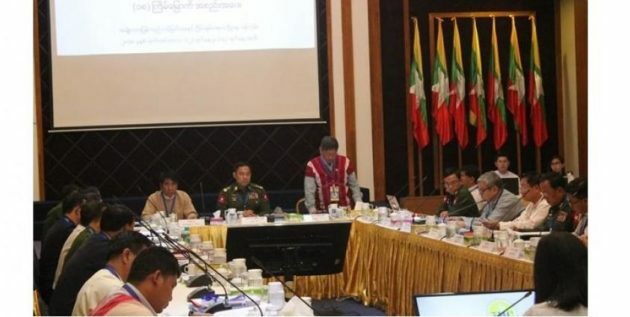 The committee officials said the 18th JMC-U meeting will cover the submission of the implementations of the decisions from the 17th meeting and discussions on tasks relating to local civilian monitoring (LCM) and ceasefire issues.